So happy with this bedroom ensemble. True to color I had yellow walls and this sets it off. Also got valances that match. I would definitely give this 100% satisfied. Thank you so much . A sunny Buttercup yellow background is the perfect showcase for these romantic Delft blue roses straight from an English country garden. A pale damask shadow effect in the background adds additional depth and interest to this lovely print. 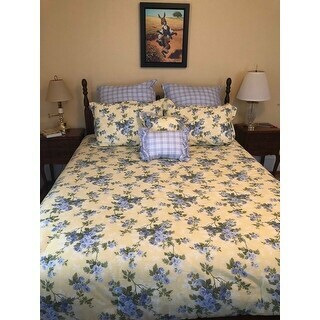 The blue and white plaid reverse appears on the European shams and a ruffled accent pillow as well as trimming a second floral pillow adding a final note of country charm to complete the ensemble. Twin Comforter Set includes: One twin comforter (63"X86"), one standard sham (20"X26"), one european sham (26"X26") and two throw pillows (12"X16")(16"X16"), Full/Queen Comforter Set includes: One full/queen Comforter (88"X92"), two standard shams (20"X26"), two european shams (26"X26") and two throw pillows (12"X16")(16"X16"),King Comforter Set includes: One king comforter (106"X92"), two king shams (20"X36"), two european shams (26"X26") and two throw pillows (12"X16")(16"X16"). You can layer in our Laura Ashley sheet sets to complete the look. Beautiful comforter set! Really finished off a newly decorated bedroom. The quality was excellent and the value was unbelievable. The Euro shams fit perfectly in 26x26 pillow inserts! Highly recommend!! I was very pleased with the quality of the comforter. The color was true to the picture. The only faults I had was the width of the comforter and the size of the euro pillow covers. My mattress is 12” deep. The comforter just barely covers it. If I were to order again I would order a king size for my queen size mattress. The euro cover was too large for the pillows I bought. I stuffed the corners to compensate. I bought a bed skirt, made some extra pillows, and window valances and am happy with the look of the bedroom. Love the colors. Happy with what I bought. Only 2 exceptions.....two of shams were square and huge! Cost me $60 for the pillows needed. Also, need a bed skirt and can’t find one. This queen comforter set is absolutely beautiful. The fabric is crisp with a lovely print design, and the level of padding is more than adequate. The little pillows are adorable! The Laura Ashley Cassidy line coordinates nicely with the Caroline and the Linley line, making it easy to get that luxurious 'designed' look. I will be back for more! Complete set is machine washable. 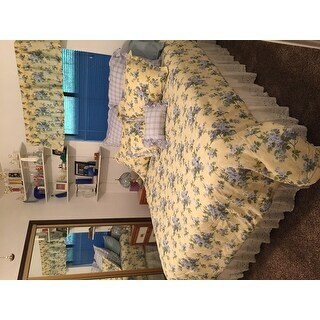 This is a bright and beautiful comforter set, it has bright colors on one side, and lite blue and white checks and stripes on the opposite. The colorful sham fits my queen pillows, however it also has the blue sham, but it is large and square, so a different pillow will need to be purchased if you also want to use the additional blue shams. A beautiful set! I bought this to go with the Felicity Baby Blue quilt set for when the weather gets cooler. It is beautiful. I will it came with three ero shams instead of just two for my king size bed. Absolutely beautiful! The colors are true to the descriptions! Extremely colorful and soothing to the eyes. I finally found my dream set! Also, all items were packed with TLC, hardly a wrinkle. People that have seen it, in the few days that I have it setup, have raved and want a set also. Well worth the price. Again, absolutely beautiful and perfect texture. Complimented my pale blue and yellow bedroom wall colors. Not the quality one would expect from Laura Ashley. The fabric is thin and does not have a soft feel. The pillow shams are flimsy and look cheap. Also, I ordered a king size for my queen bed and the length was still insufficient. Disappointed with this purchase and the $ cost to return it. This king comforter set arrived on time with no issues. The colors are just as the picture shown on the website. The quality is good matches with my room just had a new paint job made everything came together perfectly. I would recommend this to anyone looking for a comforter set. I love the colors. They go perfectly with my bed. I feel special every time I walk in my bedroom. My go to bedding Laura Ashley, the comforter is amazing! Colors are alway true to description, vibrant and never fade with much laundering. 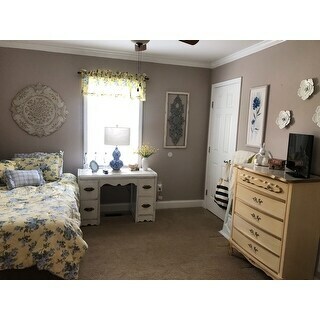 The many pieces that comes with the comforter set along with Overstocks sale made this a a fantastic purchase! Soft lovely colors. It makes the bedroom bright and cheerful. I would highly recommend it to anyone. Looks beautiful in my granddaughters bedroom. Bought it for her as a graduation gift , I'd take a picture of it but her room is a mess! Love it, have t put on bed yet....next week.its bright and I love bright. I was very pleased with the overall quality of this purchase. However, I feel the photos are a little misleading in that the width of the comforter is not as long as it appears. I needed to order a bed skirt, and I might have ordered a full size comforter to cover the sides as shown. I did purchase a second Laura Ashley set for another room as the end result is lovely. It is perfect. I only wish it had a included a plaid bed skirt. "What dust ruffle would you recommend with this set. I really must have one." Depending on the color of your walls, I would go with blue. Either the plaid blue or one of the softer blues in the comforter. Otherwise get a white dust ruffle. "Is the Laur Ashley Cassidy Conf set in king available"
"Is a dust ruffle available?" No, a matching dust ruffle is not available. "Is the full queen big enough for a large queen"
I would not think so. It fits my full sized with a little overlap but for a large queen, you might do better going with a King size. The colors look warm and cheerful! It will brighten up my bedroom! "Is the fill in the comforter stitched down to the top other than on the edge? I don't see any tacking when i zoom in."